Do you think that tweeting is taking up too much of your time? And, do you want to share your content on Twitter automatically? There are tools that can help you to automatically tweet your content in a time when your followers are most active and engaged. Why You Should Consider Automating Your Tweets? We all know that setting up a Twitter calendar can really be a time-consuming process. And we all have experienced times when we’ve run out of ideas. One great way in keeping your posting schedule full is automating Twitter. In this way, you can schedule your Twitter posts automatically in specific times when your followers are active. How Can Populizr Help You To Achieve This? In order to make sure that your content is staying fresh and unique and is reaching the maximum number of followers on your social media, you need to use different content copy. Only a small part of your followers will see your post the first time you post. That’s why it is a great idea to share your content multiple times. With the help of automation platforms like Populizr, you can start re-sharing you post without becoming a Twitter spammer. If you want to get the word out aggressively, you can use the Promotional posting scheduler. Using this posting scheduler, your social updates will be posted on your Twitter account 4 times a day, for a duration of one week. If you want to create some social buzz for your latest blog posts, it is better to use the Standard posting scheduler where your posts will be scheduled on your Twitter account, once a day, with the duration of one month. If you want to have an Evergreen sales funnel or an important blog post that you want ongoing social traffic, use the Evergreen posting scheduler where the posting on your Twitter account is twice a month during one whole year. Before you begin scheduling your blog posts on Twitter, you should take the time to analyze the activity of your followers. You definitely have to find out in which time period your followers are most active and engaged. By finding your best time periods for posting, it will be more likely to improve your clicks and engagement on your posts and, in this way, you will know which Populizr posting scheduler you should use. Social media is constantly offering you huge opportunities to connect with your followers on Twitter in a more engaging way. Anyway, you know that sometimes it can be really hard to find the right time or tool for building a successful social media program. 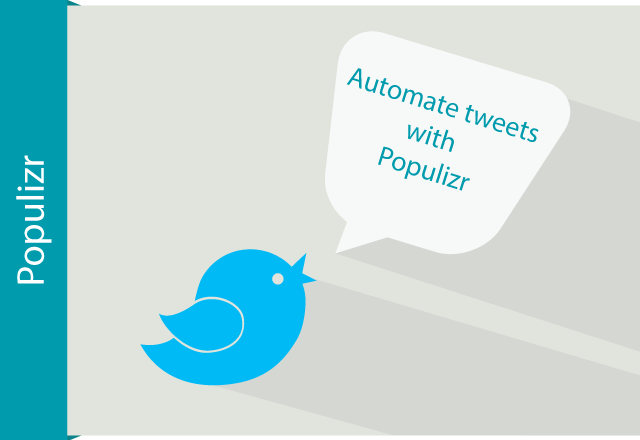 With the right automation tool like Populizr, you can manage to schedule your tweet content in the best time periods. Schedule your tweets ahead of announcement or an event, and look active and busy by round the clock tweeting.